Get 15% off your next order at PROMiXX with this exclusive promotional discount code. PROMiXX proudly present this promo code to all TroopScout users: serving members, ex-forces, and family. Click ‘Get Code’ to get the voucher code and open the PROMiXX website. Once you’ve selected the items you want, click ‘Add to Cart’. When you’re ready to purchase your items, click on the shopping cart icon in the top right corner of the screen. On the right hand side you’ll find it says ‘Discount’. Type in the TroopScout voucher code into the box provided. Click ‘Apply’. Once the discount has been applied, fill in your email address and shipping address. Click ‘Continue to Shipping Method’. Select the preferred shipping method and then click ‘Continue to Payment Method’. Fill in your payment details and then click ‘Complete Order’ at the bottom to secure your order. PROMiXX are innovators of the original Vortex Mixer, the powerful protein shaker bottle which needs no shaking whatsoever. With a rechargeable battery operated motor attached to every bottle, this is what helps create wonderfully smooth creamy shakes and smoothies with virtually no effort. To make life even easier, they also sell additional parts and accessories if you so need them. What’s more, if you’re in need of some motivation and helpful fitness guides to maintain your training, why not take a look at PROMiXX Academy where they offer insightful blogs and information on topics such as Muscle & Growth, Nutrition and Energy & Endurance. If that wasn’t enough, just take a look at the countless glowing testimonials from Olympic athletes, professional rugby players and WWE wrestlers who love to work out with their Vortex Mixers. 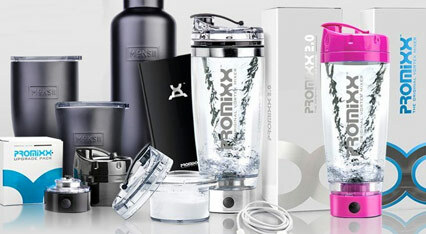 For ultimate convenience and slick looks, they’ve now also created the superior PROMiXX Vortex Mixer 2.0. Everyone goes to the gym to improve their health and fitness; why not work towards your goal in style? Power up with the PROMiXX Vortex Mixer!